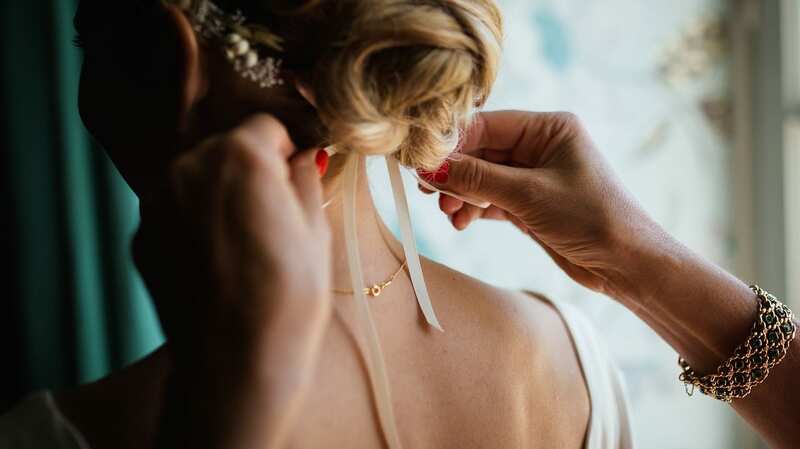 As a bride-to-be, you must always understand that your wedding day is a profoundly special occasion not just for the happy couple, but also in the eyes of your mother and other close family members. In many cases, a large number of friends and extended relatives will be present for this significant event, and the photography will be fondly treasured for decades to come. Therefore, it is essential that every bride’s mother take the time to carefully plan her entire look for her daughter’s nuptials. Not only is it wise to collaborate with a skilled makeup artist on the big wedding, but also a good amount of advance planning is key. The following paragraphs outline several valuable tips for creating a stunning mother of the bride look. Prior to thinking about specific makeup choices, it will be necessary to start working on skin issues way ahead of the wedding day. Skin concerns that many women face on an everyday basis, including age spots, rosacea and the like sometimes go unattended, but the truth is that those skin problems really can stand in the way of the flawless application of makeup when it matters. To pull off a flawless look on your daughter’s wedding day, consult with a dermatologist or schedule one or more facials in the weeks leading up to the wedding ceremony. You can also seek expert advice on the right serums and other topical remedies that may help. Spend some time thinking about the elements of your typical beauty regimen that may have outlived their usefulness. If you intend to do your own wedding day makeup, this is particularly critical. Does your foundation provide the proper coverage level for your complexion? Are you using the correct shade? Do your eyes have darkened circles around them? Is your blush providing the necessary pop of color? Go to your preferred makeup counter or schedule an appointment with a makeup professional so that you can select the ideal cosmetics for your needs. Although it is common for women to buy a new shade of eyeshadow or lipstick for major events, this is generally not the way to go. Attention should instead be focused on perfecting the skin as a whole. Just as you are open to new style mother of the bride outfits 2018, you should be open to new makeup. Weddings are among the very few life events when an incredible number of photographs will be taken, so why not take a chance and do something bold? If there are certain elements you have always been interested in trying, such as a bolder lip or a set of luxurious lashes, do not hesitate to tell your makeup professional. Of course, it is never a bad idea to schedule a full trial of your wedding day look to ensure that you feel confident and lovely in front of the admiring crowds. Even if you are extremely happy with the hair and makeup decisions you have made, doing these things yourself on the day of your daughter’s wedding can often feel too overwhelming. When the bride books professional services for herself and her wedding party, see if those same providers can work with you as well. Otherwise, make sure to schedule an appointment with your own hairstylist or makeup technician. Once the big day has arrived, you will surely enjoy this little bit of pampering to ease the butterflies. A mother of the bride is almost guaranteed to shed at least a few tears on such a milestone occasion. No matter if you do your own makeup or have it professionally applied, insist upon fully waterproof cosmetics, including concealer, eye shadow, eye liner and more. Even mothers who do not cry will find that these types of products have the longevity necessary for the endurance events that wedding days always are.